Well Brian, after recent study of research, I have to conclude that I agree with the conclusion that Ms Calvery, along with Ms Reed, Ms Hicks, and Ms Westbrook, are standing along the north side of Elm St, a short distance east/northeast of the 3 ladies who I believe have been identified by the research as Ms Jacob, Ms Holt, and Ms Simmons-Nelson. And, due to the stated identification(s), I tend to believe/conclude that a woman running, aka RunningWoman, could possibly be Ms Reed, as it appears that Ms Calvery and Ms Hicks are already at the steps as pictured. Actually Brian, I agree with your conclusion about "RunningWoman", but I have concluded her to actually be Carol Reed. I base said identification on testimony indicating that Ms Westbrook, Ms Hicks, Ms Reed, and Ms Calvery were standing together on Elm St during the shooting occurance of JFKSr and JBCJr. If I am wrong, so be it. However, if so, that error indicates another mis-identification of Ms GloriaCalvery. 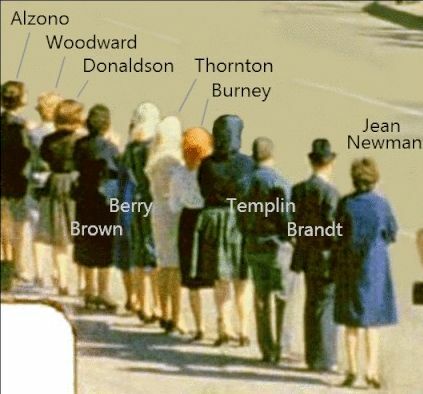 For clarification, as I/We discuss identities regarding the motorcade viewers, it is solely to ascertain correct image identification information, and is not any effort to indicate participation in the JFKSr murder, and critical wounding of JBCJr. And, if any mis-identification regarding Ms GloriaCalvery by another motorcade viewer has occurred after 50+ years, I tend to believe it to be a mistake made, but no intent to mis-lead. As seen from behind on Zfilm frame 158/160, I believe, right to left, Is Ms GloriaCalvery, Ms CarolReed, Ms KaranHicks, and Ms KarenWestbrook on the north side of Elm St thoroughfare, with others in the crowd on Ms Calvery's right, as well as Ms Westbrook's left.